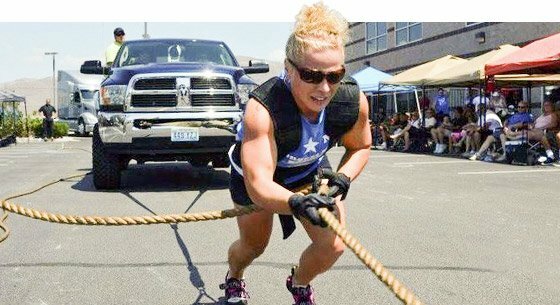 Bodybuilding.com team member Rachel Pyron is one of the best female strongman competitors in the world. 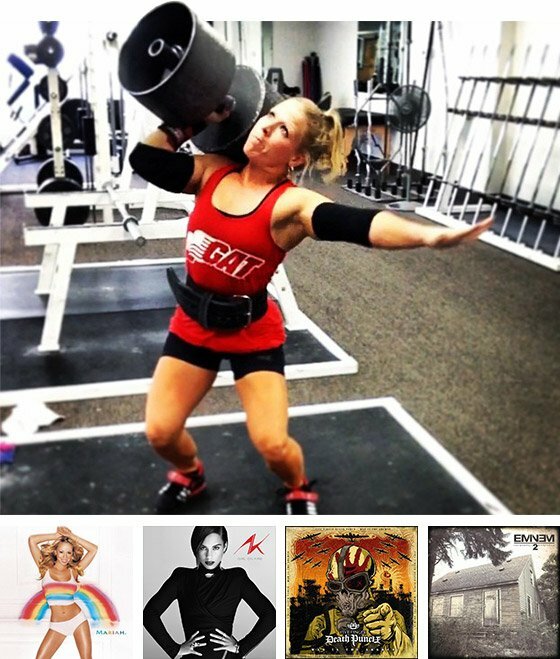 Read about the growing sport of strongman, and train like this petite powerhouse! At 4-foot-11, and 120 pounds, Rachel Pyron probably isn't what you imagine when you hear the word "strongman competitor." But pound for pound, Bodybuilding.com's eCommerce Editor is one of the strongest women in the country. In fact, this spring she will compete for the world title at the Arnold Sports Festival. Pyron didn't always see the allure of strength, though. She ran marathons until she was stopped by stress fractures in her feet. Then she cut for the bodybuilding stage, dropping to an unhealthy 98 pounds. From there, her shift to strength events gave her both self-confidence and a strong, healthy body. Read on to get Pyron's inside perspective on women in strength sports, and learn how she is preparing for the world championships! 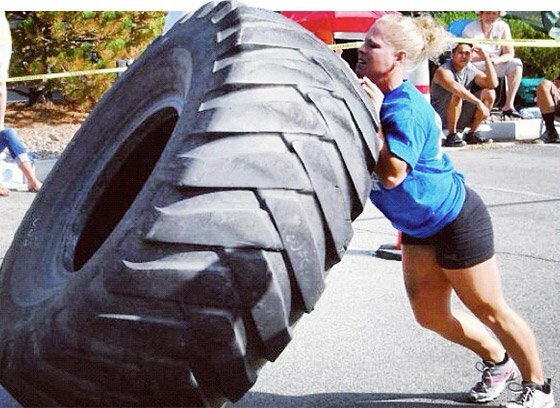 What is it like being a woman in strongman competitions? It's more awkward when people ask me if I am a gymnast, or if I play soccer. I say, "No, I compete in strongman." I get that blank empty stare that most women in the sport get. But a lot of it is because people just don't know what strongman is, or that women can compete. On TV, people are picking up stones and logs. We do the same thing, only lighter. I think it can be interesting to have those conversations, but it's also empowering to know that I am going against the grain and pushing for strength, rather than obsessing over diet and those things you can never ever feel good enough about as a female. It's a constant challenge to have that balance; I want to be strong, but also want to look good and look feminine. Strongman just gives you so much strength that you feel personally empowered. I get way more out of training day-to-day with strongman than I ever did with bodybuilding. You just constantly challenge yourself. How does the commitment differ from bodybuilding? I'm not trying to say that bodybuilding isn't a big commitment; it's just in a different way. You may be able to do a show, with dieting, in six months, but you may not see a big jump in your lifts [in strongman] for a year. There's not a lot of instant gratification. You have to look for very small PRs, even rep PRs. You can't constantly challenge your max PRs, because it's not realistic to challenge your body to hit a max weight over and over again. You have to be patient, put your time in the gym, do those lifts with lighter weight, and then stick to it long enough to see that progression. When you finally hit that PR you've been chasing—for instance, it took me two years to learn how to load a stone correctly—that is the most rewarding feeling, to rejoice in all this time and effort you put into something that seems so small. It makes you want to cry in the gym because it makes you so happy. Bodybuilding, you get that one peak moment on stage, but for me, I never had that life-changing experience. I now just want to get stronger. And by being stronger, I motivate other women to realize that you don't have to follow a typical cardio obsession, where you just use a treadmill and you're fearful of the gym. We see all the time that transformations can be very short-lived, because it's hard to set any long-term goals. When you commit to hit a 330-pound deadlift—which may take you a year or two to get—you're more committed to being in the gym every day and seeing the small progress it takes to get there than some intangible goal of having abs forever. So would you say you are focused on things you can do, versus how you look? Exactly. That's huge. Training heavy and competing in strongman has completely changed my physique. When I did bodybuilding, I weighed 97 pounds. I looked unhealthy and definitely wasn't very strong. Now I feel proud. People tell me all the time that I have tree-trunk legs, but it's something I'm proud of. I've worked hard for it, and to me that signifies strength. I can do things that most women may not be able to do. I feel confident to do things outside of the gym that carry into everyday life that I would not have if I did not compete or train the way I do. How did the switch to strongman change the way you felt about yourself? I really struggled with my self-image before and after bodybuilding. But I learned a ton from bodybuilding, and I don't regret doing it at all. Bodybuilding helped me understand eating and meal prep. I didn't know how important it was to eat frequently throughout the day. It gave me a foundation for strongman and gave me that self-confidence that I can do all these things. I can press 170 pounds over my head, and most women won't even touch that. If I can empower women who are 4-foot-11 and 120 pounds to do something they never ever thought they could do—and [show] that having striking abs and spending hours on the cardio machine is [not] their only option—then I'm happy. I think that's changing and it's not as bad as it used to be. But when you read that "strong is the new skinny," it still portrays an image of what someone should look like. But when you see women competing is strength sports, and it has nothing to do with their abs or physique, that's real strength, not just something that looks good that we're going to call strength. What happened at your last competition? The last competition was the North American Strongman National Championship in Reno, Nevada, in October. This year we had double the women who were in the weight classes last year. It's awesome to watch the sport grow. Nationals was a huge event, with more than 200 competitors from all over the United States. That takes a lot of logistics to run that two-day event with all those competitors. We had six events: four on Saturday and two on Sunday. I compete in the women's lightweight division. It has two classes: 120 pounds and less, and under 140 pounds. I placed first in the 120 and third in the 140 class. That qualified me for the Arnold in Ohio in February, which is considered the world championships. I'll compete against women from Norway and Australia and other countries. I won't compete until then. Aside from its growing popularity, how is the sport changing? It's not necessarily all about heavy weights. Conditioning plays a big part. As the sport has grown, there are more medleys to test both endurance and strength. Traditionally, strongman is heavy. If you see the World's Strongest Man, or the Arnold Classic with the pros, it's very, very heavy static strength events. With the amateurs, it includes a lot more conditioning. Strongman overall has always involved conditioning, but some of those events are expanding as the sport grows. "With the amateurs, it includes a lot more conditioning. Strongman overall has always involved conditioning, but some of those events are expanding as the sport grows." How do you plan to prepare for that weekend in Ohio? My time off is spent focusing on my main building lifts: squat, bench, and deadlift. I will back off my event practice a little bit and save it for every other week, just to stay primed for those events and to use them as conditioning. As I get closer—8-10 weeks out—I'll switch it up to focus on the events. I'll cut back on the intensity and heaviness of my core lifts during the week, which will leave me with more energy for my event day. The Arnold is a two-day contest, so I'll save two days per week for that contest prep. Some people work their event training in during the week. If they have a press day, they will do log and axle and dumbbell on the same day, or they might do stones on a certain day during the week. I do my events in one day, mostly to prime myself for the competition. When you go to a contest, you'll do five events in one day. If you're not used to that from training, your nervous system won't be ready. Also work in log and axle at times from the rack. This varies, depending on my weaknesses and upcoming contests. I try to pick three events if I'm more than eight weeks out from a contest. Once I begin contest prep, I run the events of the specified contests each Saturday. If it's a two-day contest, I split this training over two days. If the deadlift is in the contest, I will pull on event day; this will vary from axle deadlift to car deadlift to conventional deadlift. Strongman is a lot of conditioning, so I will time my events and adjust the weights until I am efficient enough to increase the weight. It must take a lot of time to work up to training like this, right? These events look like they require skill, not just strength. Yes! As the sport grows, more people look at strongman and think it looks like fun. Some people just really want to lift a log or pull a truck. But you have to have a foundation first, and you have to put your time in the gym. "I've only been in strongman for 2-3 years. It's taken me a long time to learn technique for the events specifically." I think that's where bodybuilding really paid off for me. It helped me be successful in strongman. I've only been in strongman for 2-3 years. It's taken me a long time to learn technique for the events specifically. I would have struggled more without that gym foundation first, without that upper-body strength and lower-body strength, and understanding how accessory movements help work into building strength to do the events. People forget how much time that takes. It was a huge benefit for me. How else are you different as a strongwoman than you were before? It's just changed my life completely. I found something I love to do. Before, I loved going to the gym. I loved running, then I got stress fractures in my feet, so I quit running. Your goals and interests change as you get older. I'm thankful that I was introduced to strongman, because it is empowering to train for. Even if I'm not always competing, I know I want to train for strength. I know I always want to get stronger. I have these long-term goals to hit PRs, and so I focus more on that than some abstract goal of a self-image. What else does this do for you in your personal life? The biggest thing is the people I've met [who] have become some of my best friends. In bodybuilding, I really didn't have that. In other sports, I didn't feel like there was the same camaraderie as there is in strongman. If you go to a competition, someone will finish an event and turn around and cheer for the next girl behind them. Everyone supports each other. I've been told I'm an intense competitor, so at first it was hard for me to build those relationships. I've been competing regularly and seeing the same people and getting to talk to them outside of contests, building relationships. It has influenced me. Those are women like me. We have the same interest and goals and we see a lot of things in life the same way. Those are long-lasting, true relationships, and they've been more important than anything else. It's been cool to meet women from all over the world who have similar interests. We support each other and text each other off and on. We never had that in bodybuilding. Bodybuilding was a friendship, and then we all competed against each other. In strongman, you compete against yourself. You aim for those numbers you've been training for and failing at in the gym. You show yourself that the training pays off and you come out on top. It's self-competition.